England’s social care crisis: could Germany have the answer? Posted 27th March 2018 & filed under Blog. England’s social care system is in a period of significant flux. Numerous reports and campaigners have argued over the past few years that as a nation we simply don’t spend enough on caring for the elderly and infirm to meet the demands of our ageing population, while policy-makers have proved indecisive in the face of the many demands for reform. The present Conservative government – which ran into a significant controversy during last year’s general election campaign when they pledged to reform the system by making older people pay more for their care – has promised to finally address the longstanding issue by publishing a Green Paper on social care for older people this July, alongside a national health and social care workforce strategy (the first such plan to be published since 2009) to coincide with the NHS’s 70th birthday this summer. One obvious strategy when seeking options for reform is to look at what we can learn from other countries. 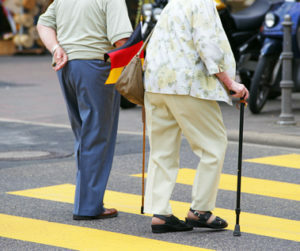 An example which tends to feature prominently in this debate is Germany, a country that has undertaken a wide-ranging set of reforms to its social care system over the past twenty years which some people would argue have successfully addressed a few of the major challenges affecting the English system. What could English social care learn from Germany? The major problems affecting social care in England (social care is a devolved matter, meaning there are different systems in operation in other parts of the UK) have been well-documented. English social care has historically been a local responsibility which is managed by councils, rather than at the national level by central government (in contrast to the NHS). Local authorities have a statutory duty to provide care services for vulnerable members of the local population (including children and working-age adults), which has meant that, as local authority spending has been cut back since 2010 under the government’s austerity agenda (overall, local authorities’ spending power has fallen by 28.6% in real terms during this period), they have had to prioritise spending on social care at the cost of other services. Social care itself has seen a 3% reduction in real-terms spending across the country since 2010, and remaining local authority social care services have become increasingly prioritised towards the poorest and most vulnerable older people, leaving over a million pensioners who were previously receiving public sector social care without any government assistance. Estimates of how large the gap is between current spending on social care and the amount which would be needed to make the system sustainable vary significantly, but earlier this year the King’s Fund argued that an additional £2.5 billion needs to be found each year by 2020. Although old-age social care only directly affects older members of society, this is an important intergenerational issue for several reasons. Firstly, the inadequacies of the present system clearly impose direct practical and emotional costs on younger people; again, estimates of their number vary, but it has been suggested that 5.4 million people provide unpaid social care for their elderly friends or relatives, and many of these carers are presumably adult children and grandchildren. Secondly, its inadequacies also impose an additional burden on the NHS, particularly hospitals through unnecessary A&E admissions and delayed transfers of care; the NHS is primarily funded through taxes on younger workers. Thirdly, if the current system requires local authorities to make cutbacks on other services (which the National Audit Office has shown is happening), then that also has knock-on consequences for both taxpayers and other service users. Fourthly, the debate about finding a new funding settlement for social care (which is often elided with the related problem of finding new ways of funding the NHS) often assumes an intergenerational dimension, with possible solutions that would leverage more public funding into the system (e.g. higher national insurance contributions), broadly speaking involving imposing higher taxes on the working-age population – unless entirely new funding streams are devised which specifically attempt to raise money from older people, such as making people who work beyond state pension age also pay national insurance. Alternatively, possible solutions that would require older people to contribute more towards the cost of their own care would involve raising the money from older people themselves (which is the one of the reasons why the Conservatives’ 2017 manifesto idea was so controversial). As it stands, under the current system, wealthy pensioners with significant care needs can end up losing most of their assets, often in return for a standard of care which is too low, so there is a crucial debate to be had about where the state should step in to mitigate against this (if at all). This attaches the debate about social care funding to much larger political and philosophical questions about the appropriate balance between local and central government in providing public services, and individual responsibility versus collectivised social welfare. A recent report from the Institute for Fiscal Studies (IFS) showed that the current system’s reliance upon local authorities as the lynchpin of the care system is likely to run up against the government’s desire to make councils more financially independent. Currently, councils receive a large part of their funding from central government grants, with the remainder coming from locally-raised taxes (mainly council tax and business rates) and charging fees for services; under current plans, the government wants to virtually abolish central government redistribution between wealthier and poorer areas and make all councils fund themselves, as they believe this will provide a much greater incentive to stimulate local economic development. However, the IFS warned that under such a model, many councils would find that increases in the demand for social care would rapidly outstrip growth in their local tax bases, leading to less and less money being available to fund everything else (a scenario which recalls the infamous “Graph of Doom” modelled by Barnet Council). To admirers of Germany’s social care model, this is one of the problems which that country has managed to solve. As Caroline Glendinning and Mathew Wills argued in a recent blog for LSE Politics and Policy, Germany’s social care system was in a similar position to the one its English equivalent is in today 20 years ago, until both major political parties reached a cross-party agreement on an ambitious package of reforms. These reforms had several core elements. Firstly, responsibility for social care was effectively transferred to the national government, taking it away from Germany’s powerful states which had been struggling with rising costs. Secondly, the decision was taken to pool the risk of social care costs across the whole of society rather than forcing individuals to bear all of it. This is important, because figures from the Dilnot Review of adult social care showed that roughly half of all over-60s will die without ever needing any social care, but around 10% will need care costing over £100,000; in other words, the risk of needing social care is highly skewed, but it is difficult to predict in advance who will actually have the highest costs. The German government did this by imposing a relatively small tax on all workers (currently 2.5% of salary up to a salary ceiling), with employers meeting half of the cost on behalf of their staff and retired people still having to pay the full amount. As it is based on collective social insurance, a key principle underpinning the German system is that there is no means-testing, with access to funds being determined almost exclusively on the basis of assessed medical needs. People who are allowed to draw on the system can either claim cash benefits up to a certain level which are used to reimburse informal carers (who mainly tend to be family members), or they can receive in-kind assistance from paid professional carers who are commissioned by the social insurance fund itself. The funding is directly hypothecated; all of the money raised by the insurance levy gets transferred into legally distinct insurance funds, which can’t be raided by the government for anything else. The authors of the LSE piece argue that the central government has managed to ensure tight cost containment of the scheme, which has seen the levy rise by just 0.8% of salary since it was introduced, even though eligibility has been expanded to include a wider range of disabilities. However, as the King’s Fund pointed out in their review of social care systems in other countries, these funds are only intended to cover basic needs; poorer people are expected to rely on other social benefits to top up the money which it provides, while wealthier ones have to either rely on their own funds or take out private insurance (the private insurance market having expanded to offer social care products because the social insurance system makes the risks of doing so easily assessable). The German model is not perfect by any means; as the King’s Fund pointed out, it faces its own rising cost pressures (some experts believe the levy may have to rise from its current level of 2.5% of salary to 4.5%–6.5% over the next 30 years, potentially a significant additional burden), and a significant feature which is built into the system is the assumption that family members should be paid to provide care for their relatives, not an idea that would necessary be electorally popular in this country (even though it is what many people end up doing anyway at present). However, it does arguably address a number of the problems facing the system which we currently have in England: most importantly, it provides almost everyone who needs care with a reliable and reasonably generous safety net; it divides responsibility between the state and the individual in a manner which has proved to be politically sustainable; it has provided a sufficient degree of funding whilst containing costs; and – from an intergenerational perspective – it achieves a fairer balance between different generations than funding from general taxation alone would be by including pensioners within its tax base. This is more intergenerationally equitable than the various solutions that have been proposed for funding social care in England, which would involve making small increases to National Insurance, for example, as that is only paid by workers. Given the importance of finding a sustainable solution to the adult social care crisis, aspects of the German model deserve to be considered.